Dental veneers are basically porcelain layers that adhere to your teeth to give them the ideal shape and look that is conventionally desired. These layers are thin and it is almost impossible to identify them with your other teeth. There is a wide range of options that one can choose from while getting a dental veneer and your dentist will help you find your perfect pick. Why do you need a Veneer? 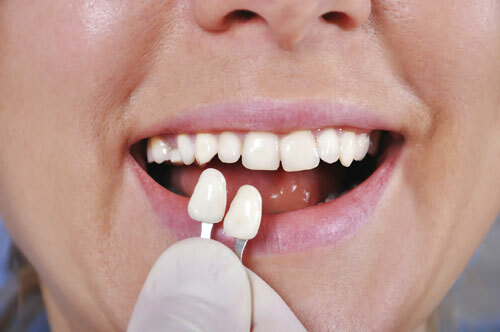 Porcelain veneers can be matched to the exact shade to improve the color of a stained tooth. A veneer can lighten the shade of your front teeth, if they have are specifically damaged from smoking cigarettes etc. If you have a chipped tooth, a dental veneer can make it appear as a whole tooth again. If orthodontics is not an option for you, dental veneers can also be used to fill small gaps between teeth. If one of your teeth is not in the same line as the others, a dental veneer can be fitted into the gap and the tooth can be brought in line. If you have a crooked tooth, a veneer can be used to correct it. Dental veneers are usually made of porcelain. Sometimes, they are also made of composite resin. The best person to help you choose the ideal material for you is your dentist. Both porcelain veneers and composite veneers have their own advantages. These veneers do not stain as easily as the other variant. Even lesser tooth enamel needs removal in comparison to porcelain veneers. Easy to fix and repair and hence an advantage since they do not last very long. Less expensive than porcelain veneers. Takes no more than one visit to be attached. Quarterly or annual visits to the dentist are recommended after getting dental veneers to rule out possibilities of decay or the veneers coming loose. It might take you a few weeks to get used to the feel of a dental veneer.